Hello! My name is Khôi and I’m the proud owner of Atelier 7570. I set up my Etsy shop in June 2017 to sell my handmade pottery. I throw, trim, embellish, and glaze every single item so you’re guaranteed a truly unique and charming pot made by me, with love. Nature and simplicity inspire me so I often incorporate those elements into my craft. For me, Making + Clay = Happiness! I'm grateful for such a creative outlet and excited to be sharing Atelier 7570 pots with you. March is National Women's History month and today is International Women's Day! The first time I heard of this "holiday" was on a visit to Italy back in 2001. It was a big deal over there and I had not heard anything about it in the US. Since that trip, I've become more aware of the day and the overall global growth of celebrating women. I find it inspiring and in joining the world in celebration today, want to share stories of female inspiration from NY Handmade Collective team members. The NY Handmade Collective member base is almost exclusively women artists and business owners trying to change their economic path, do positive work for the health of our planet and our bodies, and make really amazing handmade art and goods for consumers predominantly in NYC, but beyond our borders. I should note that our team does have men - creative men, that own Etsy shops and make gorgeous art, and help run our team - who are deeply appreciated. The stories below brought tears to my eyes, but even more, I was humbled. To share deeply personal stories about women is to share stories that shape us individually - not all stories are light and fun, but almost all of them leave you feeling connected and awed. I hope you enjoy these stories, as well as feel inspired. When you buy handmade, there is often a strong woman of the past celebrating not just your purchase, but the continuation of their lives, skills, and expertise from our hands to yours. "A woman who inspired me was my aunt, Dorothy Finkle Kaufman. Dorothy was unusual in her family of 8 siblings, as she contracted polio at the age of five in 1910 in Trenton, New Jersey. Her very devout Jewish father even brought her to the nuns at a local convent for prayers in the hopes of healing her. He parents were immigrants from Russia and Lithuania and her father owned a general store. Money was tight and he lost it during the Depression. Dot was a vibrant and capable member of her family who was not content to stay at home and be cared for; she was a graduate of Rider College and went to work as a secretary, wearing special shoes, leg braces and using canes to walk. She helped other disabled people find employment while working for the State of New Jersey and in her forties, married her boss, Benjamin Kaufman, a highly decorated veteran of World War I and winner of the Congressional Medal of Honor and Croix de Guerre. Despite her disability, she traveled worldwide with Ben both politically and socially, unlike her able-bodied brothers and sisters. She and Ben, who were married for over 30 years until his death in 1981, became parents to her parents, served as the foundation of her family, and built a home that accommodated their physical limitations. She was my father’s closest sister and confidante, and my surrogate mother. it was a pleasure to be a part of her world, as she had exquisite, sophisticated taste and was a lovely and gracious woman with a twinkle in her eye and lavished love and attention on me as if I were her own daughter (she had no children). We had a special connection and I admired her for her fully realized life, despite a truly terrible health event. I like to think that my hours spent playing with her jewelry box, examining the decor in her home, its textures and colors and absorbing her many interests prepared me for my career as a designer, first in theatre, where I designed costumes for over 30 years, and now as a metalsmith, where the design journey continues. She died in 1987, but in the 30 years since she has been by my side, cheering me on, inspiring me to keep going and creating, no matter what. My grandmother, Esther Meyerson Bialo, was a single parent. Born in the 1890’s, in addition to being a public school teacher in NYC, she was a theatrical costume designer. As a kid, I poured over her collection of books on the history of fashion, and spent many hours draping and pinning fabric she had collected from all over the world on a mannequin in her apartment. My mother, Margarita Teresa Padin, as an underage teenager ran away from home and joined the army in WWII using someone else’s identity, and spent the war working as a truck dispatcher. She took courses in celestial navigation because she wanted to be in the Merchant Marines. After the war she obtained a degree in mechanical engineering. She collected tools and made repairs around the house. Because we had no money, and because I think she needed a creative outlet, she made all of our clothing when we were kids. Always practical, she used Velcro for fastening our clothing (to my mortification as a kid; as an adult I have to respect her engineer’s approach to problem solving), long before its use became popular. Both of these women also loved and collected jewelry, and under their influence I did as well for years before I began making jewelry. I absorbed their aesthetics and their appreciation for color and texture, and I think their influence is reflected in my jewelry. My current display incorporates some of the fabric they collected. My mother’s sewing machine is in my studio, and I still use some of her tools. My memories of them keep me company when I’m in my studio. My name is Raquel. I just joined the team this February. My Etsy shop is www.maquina37.etsy.com and I specialize in making cloth doll caricatures of people. I also make quilts and greeting cards. A doll that is custom made to look like someone sends the message “I love you, just the way you are.” I would love to share the story of two women who have inspired me. My mom was 26 when she came to the United States from the Dominican Republic. She had six children and was a widow. She also started working in factories (sewing) to make enough money to bring her children over one by one. She met my father, was remarried and had me. All seven children grew up together. But unfortunately, my mother was widowed a second time when I was ten. Despite all the sorrow she has faced, she keeps going, and she is always happy and graceful. She recently retired at 69 years old. She is now taking English classes, traveling and enjoying life. The other woman who inspires me is my wife. My wife is a retired police officer. She joined the police department in the late 80's. She faced a lot of discrimination for being a woman and for being a lesbian. Despite the hardships she faced, she lived openly and had a successful career. I feel in love with her strength and courage. I asked her to marry me in 2014. We were married in August of that year. And in 2016, she was diagnosed with breast cancer. That same year, I ran the New York City Marathon and dedicated the race to her. At the finish line, a read this little speech I had prepared, "....Whenever I doubted myself, you were my confidence. And, you were always honest and nurturing. Over the last few months, you were struggling with your own race. And still, even when you weren't feeling good, you always managed to put us first. You were always selfless. You taught me that 'life is tough my darling, but so are you.' You were my strength...I dedicate my run to you. All 26.2 miles for my wife." I gave her a necklace with the pendant of the marathon with the inscription "for my wife" on the back. She beat cancer. Oh my gosh, I rattled on for a long time. The point is, my mom's work ethic inspired me to create a business of my own. And, my wife's story encourages me to embrace who I am and do the things that truly make me happy. The first doll I ever made that looked like someone was of her. I am inspired by nature and every women who has worked to preserve and conserve nature, land, and parks such as Eleanor Roosevelt, a Former First Lady of the United States of American, and also Susan B. Anthony, a reformer, educator, and advocate of women's and human rights. Both women lived in NY State. The preservation of nature is directly related to that of women's right and human rights. It's shown in patterns, color and the textures of the different seasons. ETSY is a global market place that gives artists the right to engage and believe in humanity. It's also a place where a lot of women own small businesses. I owe my inspiration to my mother and grandmothers, the latter of whom came to this country from Russia. My grandmothers knew very little English and would speak to my mother and father in Yiddish, bits of which I picked up over the years. Both grandmothers were very creative; and I remember how we'd put holiday stencils up on the windows, wrap and decorate Christmas gifts, etc., which were very innovative in their own right. However, the most creative and imaginative was my mother; and I'm sure I inherited her craft genes. We didn't have extra money for toys and dolls' clothes; so even though she worked full-time, on weekends she'd fabricate all my dolls' outfits which she'd sew by hand and make wonderful paper doll families for me to play with. I wish I had saved them. Give thanks to the women in your life. Celebrate their success, failures, and inspiration. Happy International Women's Day! S2 Stationery & Design is owned by Sara Stroman, a NY Handmade Collective team member since 2010, and current Marketing Director. She believes in the power of written word in all sincere communication and designs cards and stationery to inspire people to put down their phones and pick up a pen and share honest emotion. Her work is inspired by her international travels, nature, and the words of people both famous and not, doing good, bad, and great things. Over the last 40 years I've been a vegetarian of every sort, lacto-ovo, and vegan, often varying day by day, week by week, or month by month. Summer tends to be a vegan season for me. In my quest to recreate this recipe, some of my experiments did work out well. Yet, through this, I found my go to breakfast for company - a delicious frittata. I generally lightly steam the vegetables first before assembling. The bottom layer is either potato or cauliflower thinly sliced. Then whatever veggies I have tossed on topped. My most recent was butternut squash & broccoli. Then eggs lightly whipped poured on top and a little cheese -vegan or other- sprinkled on top. I cook it on top of the stove until I see bubbles then put it under the broiler to finish. Quicker then baking and also keeps in moisture. Recently, my cousin's husband passed along this recipe for the perfect soft boiled egg: Put two inches of water in a sauce pan with a lid. Bring water to boil, place eggs in a strainer or vegetable steamer above the water, put on the lid tightly. Steam for six-and-a-half minutes. Run under cold water and Voila! From those in the know, let me share their secret for perfectly fluffy scrambled eggs: whisk them until you see a light yellow color. Some that I spoke to, add milk, or creme fraiche (I use plain yogurt) during the whipping, while others add after. Cook them very slowly - five or so minutes - going as far as to moving the pan on and off the burner. They should be soft and sort of lumpy. Add seasoning to taste, once they are off the stove. Good with avocado toast, what isn't? This final recipe is my new favorite for quiet Sunday mornings. Julia Turshen's Olive Oil-Fried Eggs with Yogurt & Lemon. In a small bowl, combine yogurt and a big squeeze of juice from the lemon half and whisk together. Scrape the mixture onto a plate and spread and swoop it so the yogurt covers most of the plate. Warm olive oil in a heavy pan. Crack eggs into the pan and season with salt & pepper. Sprinkle a few drops of water (less than a teaspoon) into the skillet being sure to hit the pan not the eggs. Quickly cover the pan. Let the eggs cook until the whites are cooked through but the yolks are still a bit wobbly, just a minute or two, I did two. Transfer the eggs to the prepared plate, setting them on top of the yogurt, then pour the remaining olive oil from the pan over the top. Squeeze whatever juice remains in the lemon half and scatter over the herbs. EAT- so good! February 06, 2018 by Lauren Rogoff in "travel", "travel art"
When I travel, one of my top draws to any destination is the opportunity to see wildlife and nature. Given that, I can't believe it's taken me so long to visit Costa Rica! Costa Rica accounts for only 0.03 percent of the earth's surface, but contains almost 6 percent of the world's biodiversity. 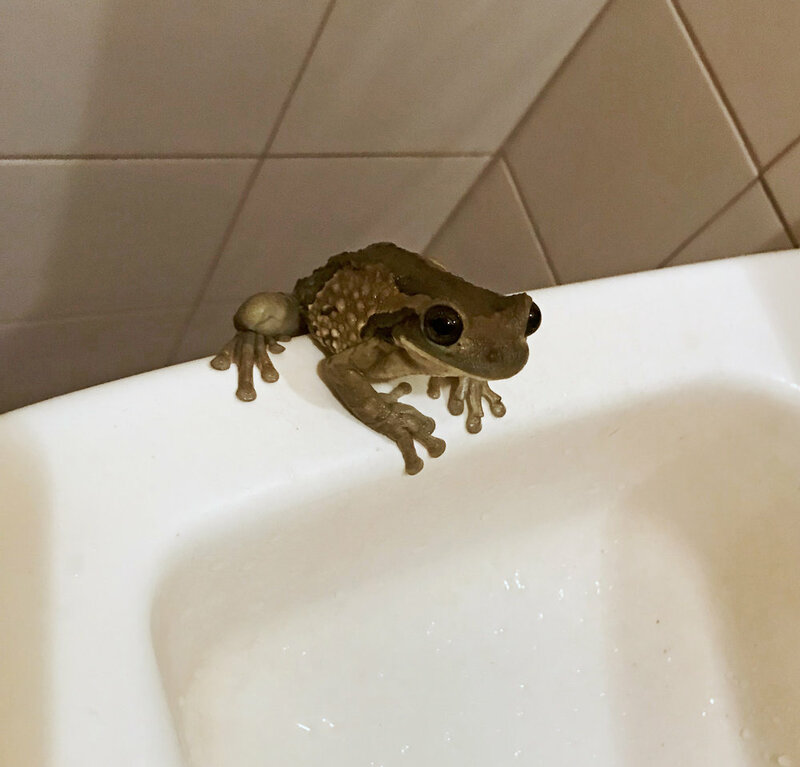 I was excited to see sloths and other furry creatures, but I never expected to see and learn about the incredible variety of frogs and birds populating the incredible country. I was there for less than two weeks, and visited a few different locations throughout the country, but there's so much left to explore! I spent the first few days horseback riding, through small towns and countryside in Guanacaste, on a native Criollo paint horse. This is the lovely Leyenda! Sometimes the most entertaining animals are right nearby! We moved on to Monteverde from there. The bed and breakfast we stayed in had a little forest in the back, with a very popular hummingbird feeder- there were this many birds at a time pretty much always! We saw three different kinds of venomous snakes in Costa Rica, on various walks through forests. This was the first, and he was small but deadly. This little agouti was a very avid snacker. We also saw kinkajous, coatis, and peccaries (a rare sight!). It was incredibly helpful to have a knowledgeable guide on our nature walks, to tell us about the animals and help spot them. 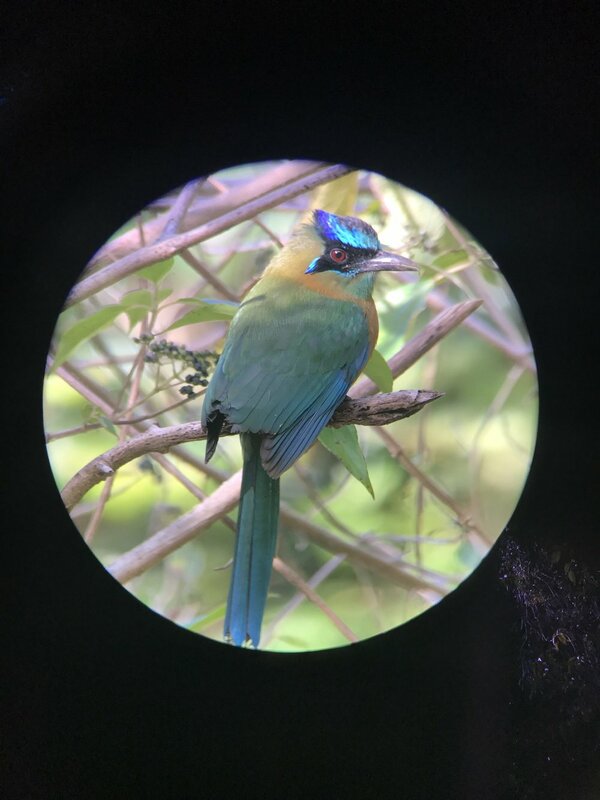 Another amazing advantage of guides is that they typically have scopes that they carry with them, so in addition to spotting lots of animals, we were able to view them in incredible detail, and take photographs using the scopes (called 'digiscoping') which was really fun! This bird is pretty numerous in CR, and his colors were so vibrant. 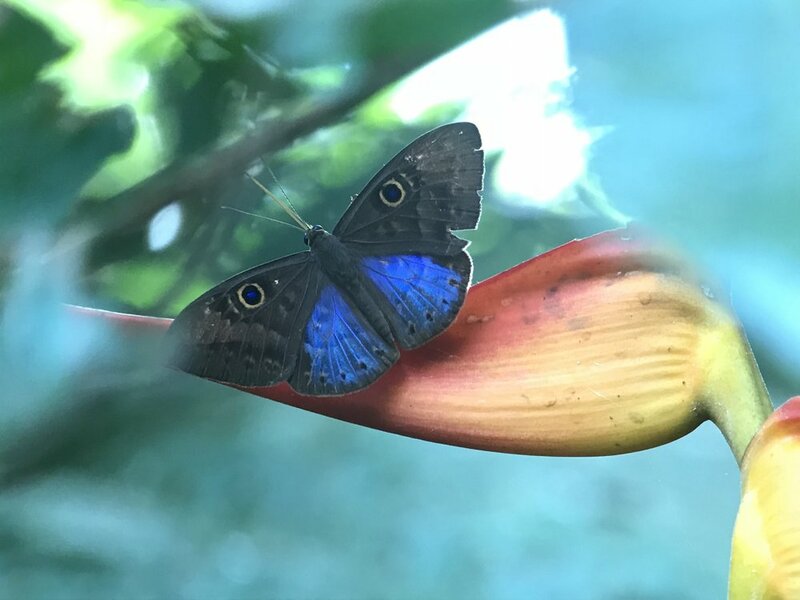 We visited a butterfly and frog park in Monteverde to learn more about some of the creatures we'd seen and were hoping to see. The camouflage on this butterfly is pretty effective, and the insides of his wings are iridescent blue! We so so many awesome frogs, including this one which is emblematic of the country, the red-eyed tree frog. Look at that color and shape! Not all of the frogs we saw were full-grown... there were thousands of tadpoles in various stages of development in this pond! We then went to Manuel Antonio, a famous nature reserve park with a wonderful diversity of wildlife. With yet another amazing guide, we spotted lots of new friends! These crabs hang out on land; I had no idea! The ocean is almost a 20 minute walk from here. Commonly referred to as the Jesus lizard, because he can walk on water! And finally, at long last, we saw a sloth!! Sloths are not only adorable, but super fascinating. There are both two and three toed sloths in Costa Rica; one is diurnal and one is nocturnal. There are three different types of monkeys and we saw all of them. Here's a cheeky capuchin who had stolen a loaf of bread from some tourists and was eating it slice by slice. These were just a few of the menagerie I saw in Costa Rica, and I stayed along only part of the Pacific coast. I got so much inspiration for future watercolor paintings. I can't wait to go back to discover even more! I have a very cute and fun cat with a problem. She only is nice to me, this started about a year ago and I would have never known if one of the cat feeding group ( yes I'm very lucky to have this group in my building) hadn't told me Sugar was acting differently. Shortly after that on her yearly visit to the vet she bit the assistant, broke her skin and HAS A RECORD! They have to report this type of thing. I forgot to mention Sugar is a polydactyl girl. You can see her thumb if you look closely. After the neighbor and vet incident I started to look into some calming remedies for when she was going to experience anyone aside from me even though I mentioned to her biting or hissing at the hand that feeds you isn't a good idea. First I tried Rescue Remedy a flower essence combination. It apparently worked until my neighbor tried to pet her. The vet suggested Comfort Zone feliway, a pheromone spray for stress reduction. Again a sort of solution as long as no one got into her space . A homeopath suggested Straphysagria which works if given a day or two before if I know in advance. Apparently herbs work but not as quickly as homeopathy or flower essences (be sure to get non alchohol varieties of anything) and they don't taste good. Chinese medicine and acupuncture are also recommended but not along with homeopathy as they are too similar. Unfortunately I still have to give her drugs before going to the vet. Hey I'm just a normal kitty! Yesterday in the laundry room I found a copy of Dr, Pritcairn's Natural Health for Dogs & Cats and now have many more things to try. Sugar's diet has for the last 7 years been perfect according to them. She's been eating a raw food diet though I have no idea what she ate before or how old she is. It seems she may need to play more. During the rest of the years she goes outside on a lead on my terrace. Then she chases bugs etc. Thankfully there are no bugs inside but it's been hard engaging her with the variety of things we do have here..Strings, balls, feathers all are fun for a short period. Suggestions welcome. For now waiting for Spring to arrive and hoping that this behavior goes as quickly as it came. I just want to be out here playing with bugs and watching birds fly by. 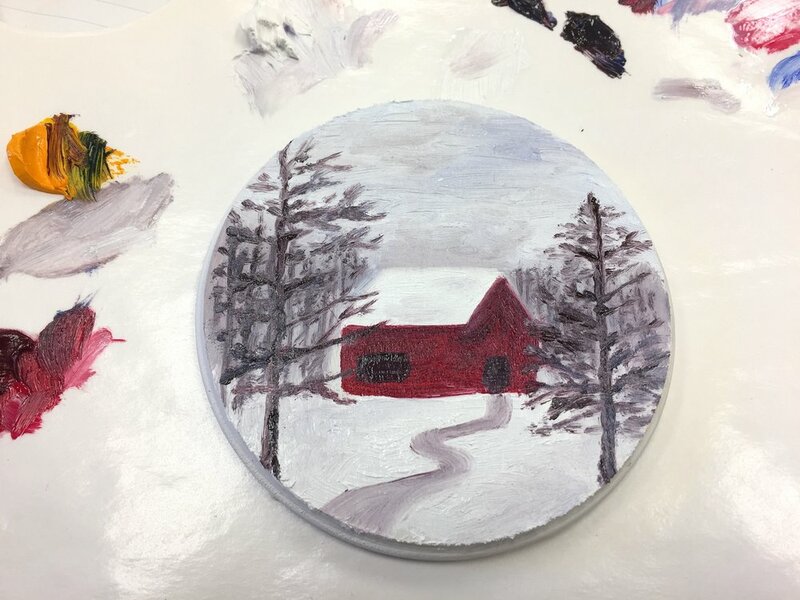 Inspired by the nostalgia of the traditional winter scenes by Currier and Ives, this painting was completed in one afternoon by mixing only a few paint colors. A wood plaque can be primed with gesso, or a small canvas, or other surface can be used. While these instructions give specific color combinations, feel free to improvise your color mixing and create your own winter landscape. Enjoy! The dark gray suggests a forest in the distance. Plan out a simple composition which will include a red barn, a horizon line with suggested tree line in the distance, and a few larger trees in the foreground. Don't be too concerned about fine details. Working from light to dark, paint in all the white areas, including the snow-covered rooftop. Use small amounts of red, blue, and yellow to create gray, Use this gray to paint a series of vertical lines for the tree line in the distance. Add white to create different shades of gray. Mix a purple using red and blue. Add white in desired amount to paint a lavender texture in the sky. Use a dark gray (mix more if needed) to paint a curved path. Show perspective by widening the path near the bottom of the composition. Blend in some gray to shadow the snow, adding small amounts of blue and lavender for dimension. Paint the red barn, darkening the window, door and shadows with dark purple/blue. Using the tip of your brush, gently paint tall tree trunks in the foreground, adding branches with thin shorter lines. Finally, create a runny mixture of white paint to spatter on snowfall as a finishing touch, if you wish.